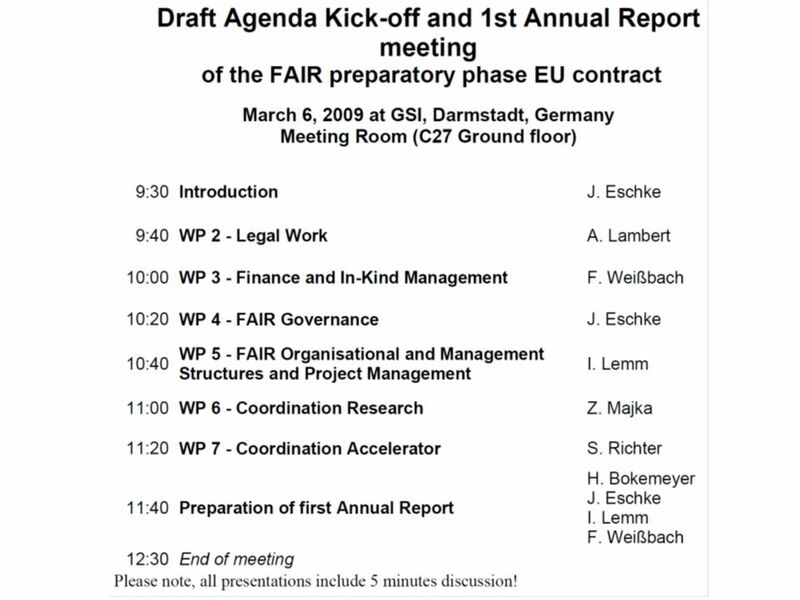 International Accelerator Facility for Beams of Ions and Antiprotons at Darmstadt EU FP7 FAIR pp - 1st Reporting meeting March 6, 2009 J. Eschke, GSI EU. 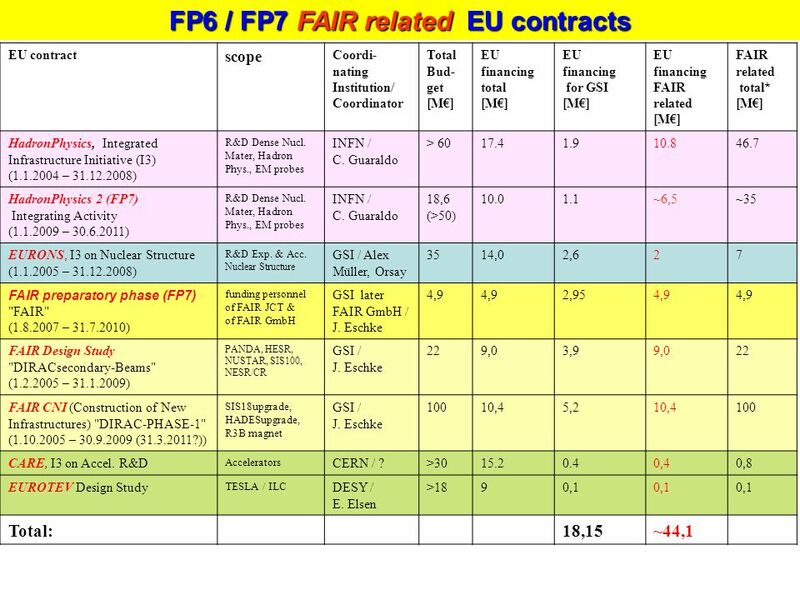 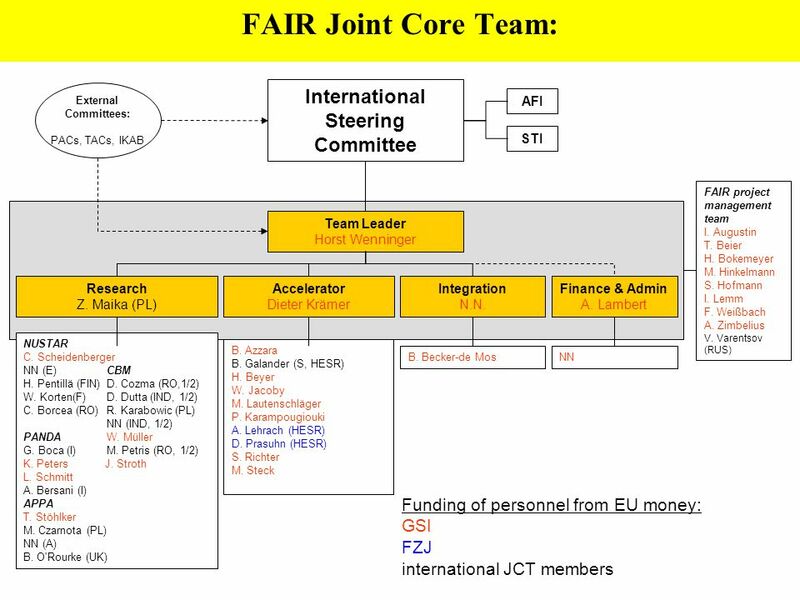 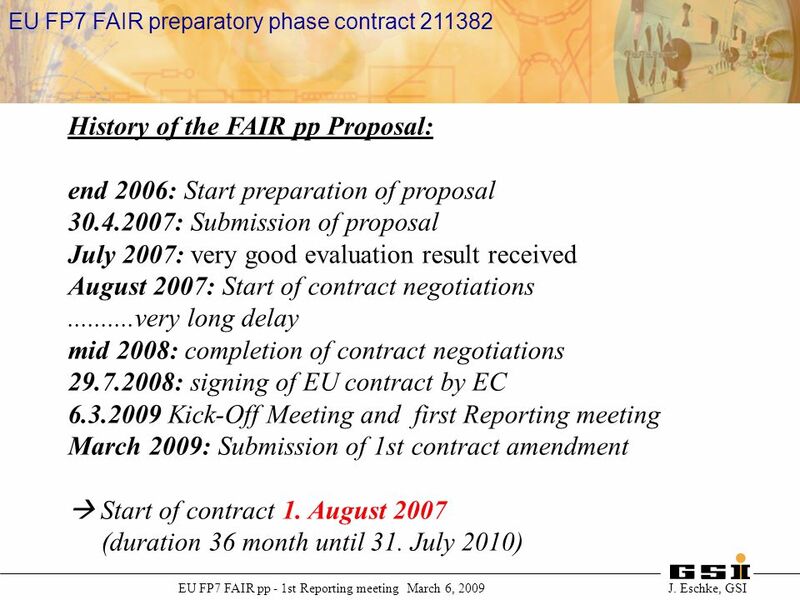 Download ppt "International Accelerator Facility for Beams of Ions and Antiprotons at Darmstadt EU FP7 FAIR pp - 1st Reporting meeting March 6, 2009 J. Eschke, GSI EU." 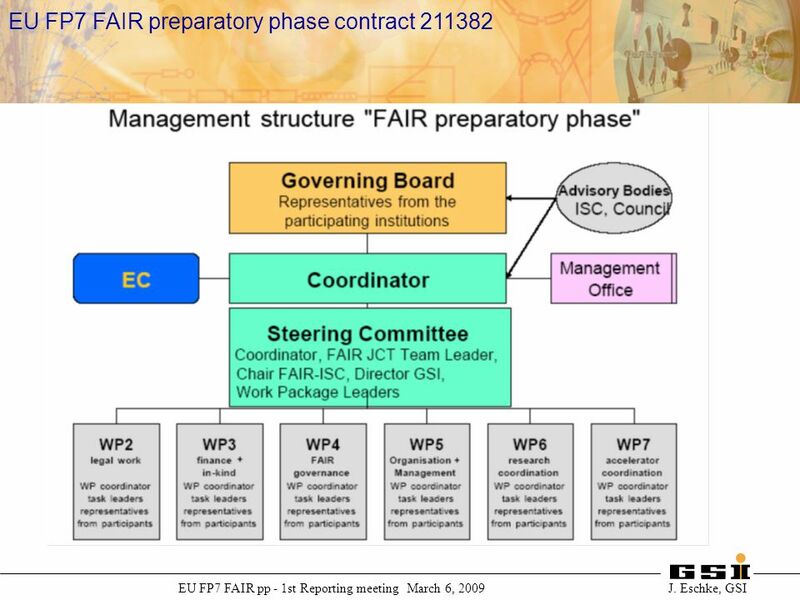 FAIR – Status Report Walter F. Henning NuPECC Meeting -- March Venice. 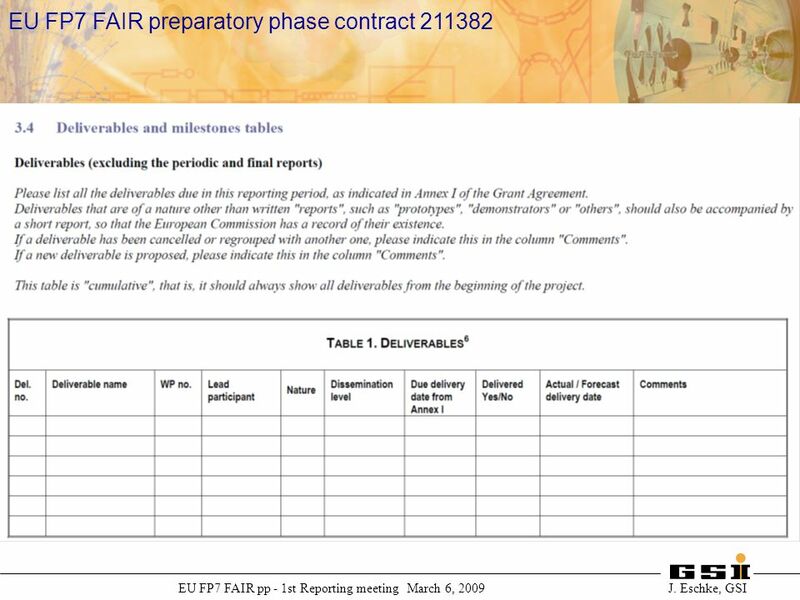 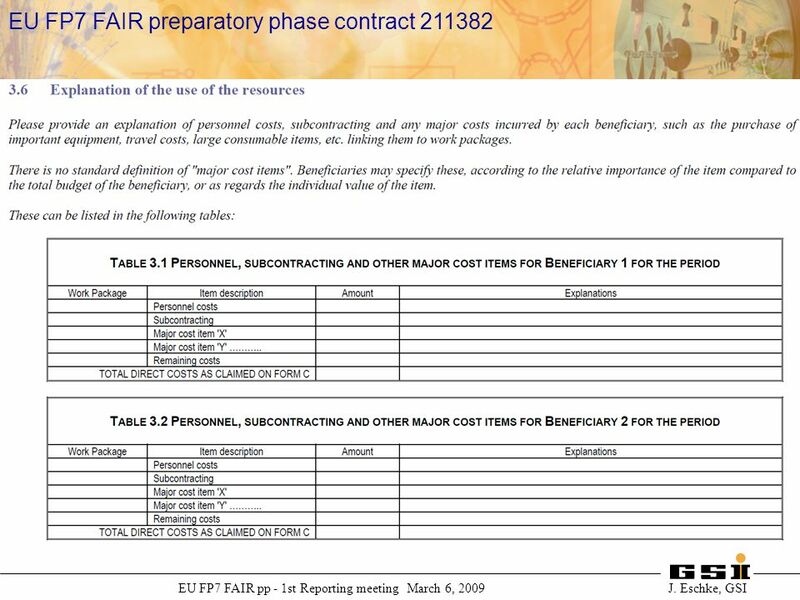 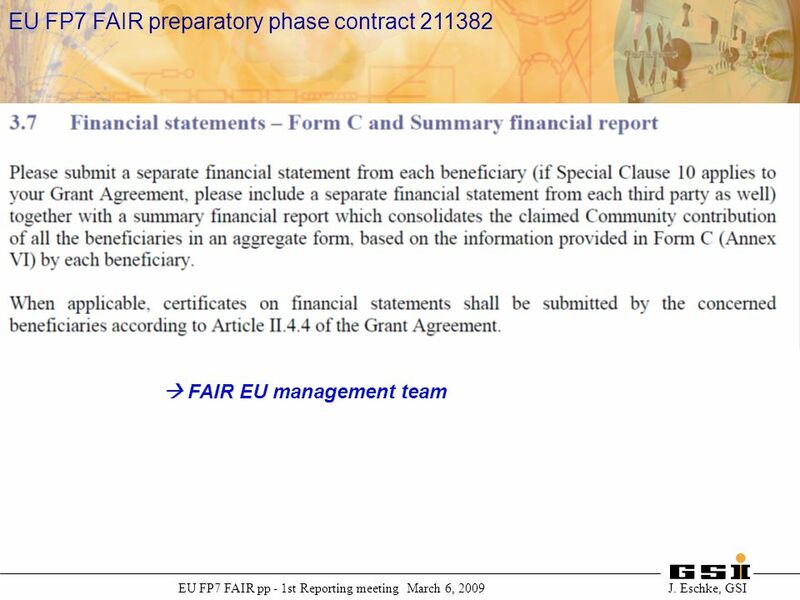 ACCEPT project Grant Agreement FP7-SSH-2009-A. 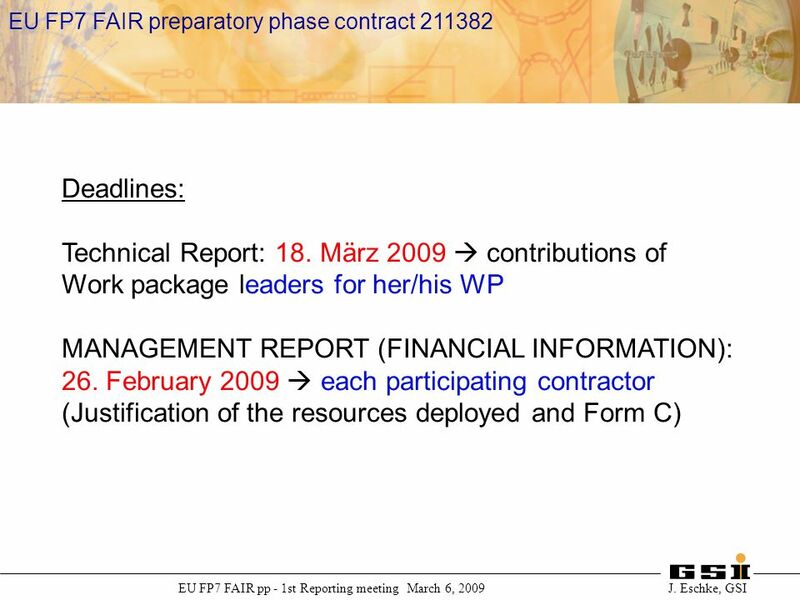 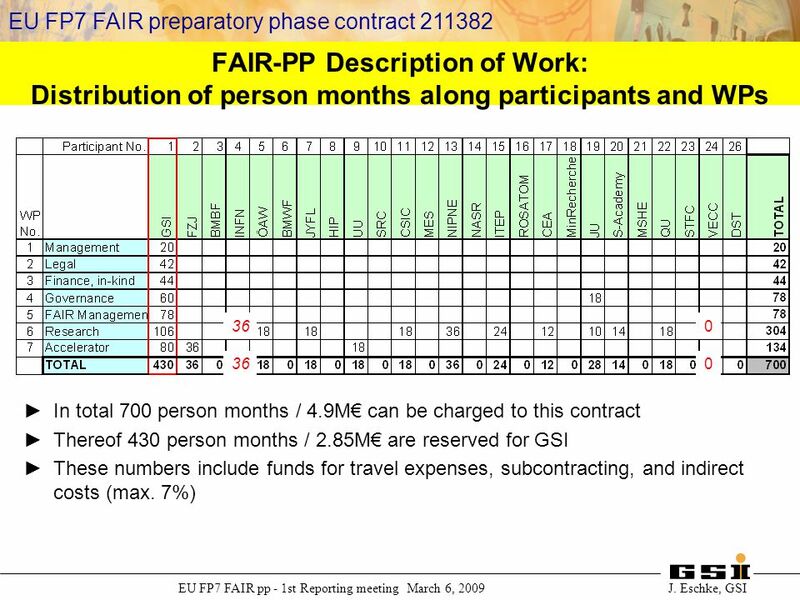 Introduction 1 Proposal for the structure of FAIR GmbH construction phase 2 Relationship between FAIR GmbH and GSI mbH construction phase Contract Site. 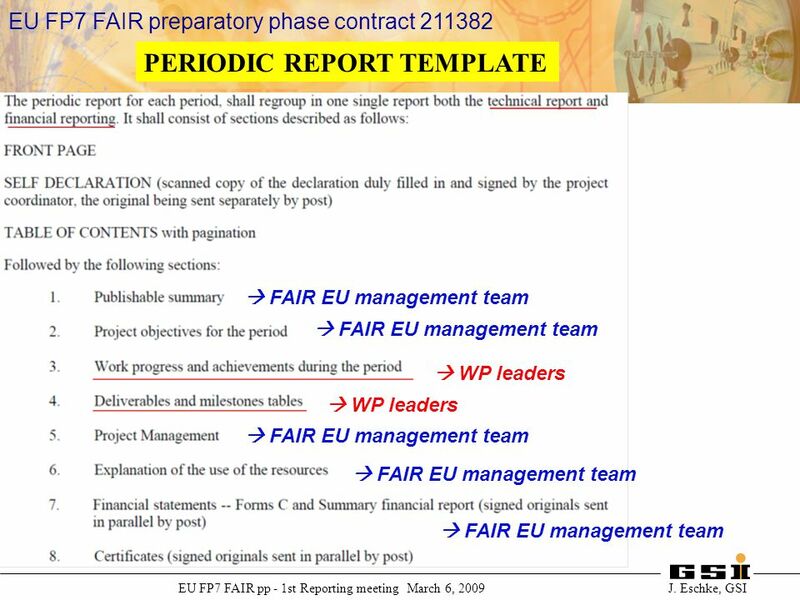 JERICO KICK OFF MEETINGPARIS – Maison de la recherche - 24 & 25 May 2011 JERICO PROJECT The contract management Overview By Dominique Guéguen / Ifremer. 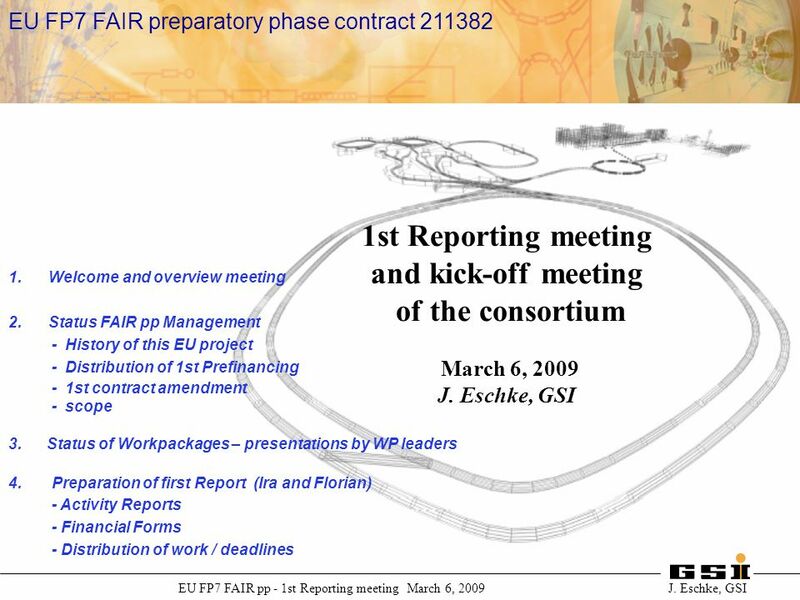 Supported by Project Administration Second Project Meeting London, 10/11 March 2009 Liv Becker / Veit Bürger, Öko-Institut e.V. 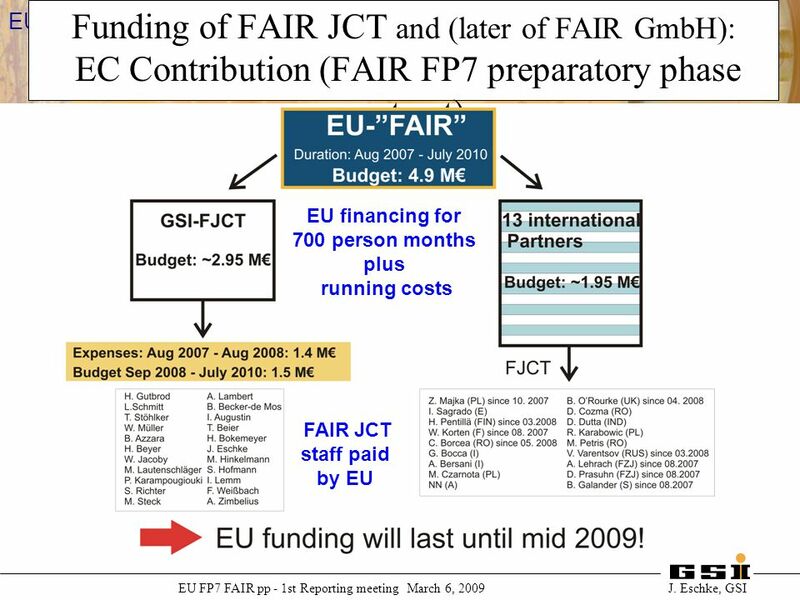 The Facility for Antiproton and Ion Research in Europe Günther RosnerNuPECC, Sevilla, 5/10/121. 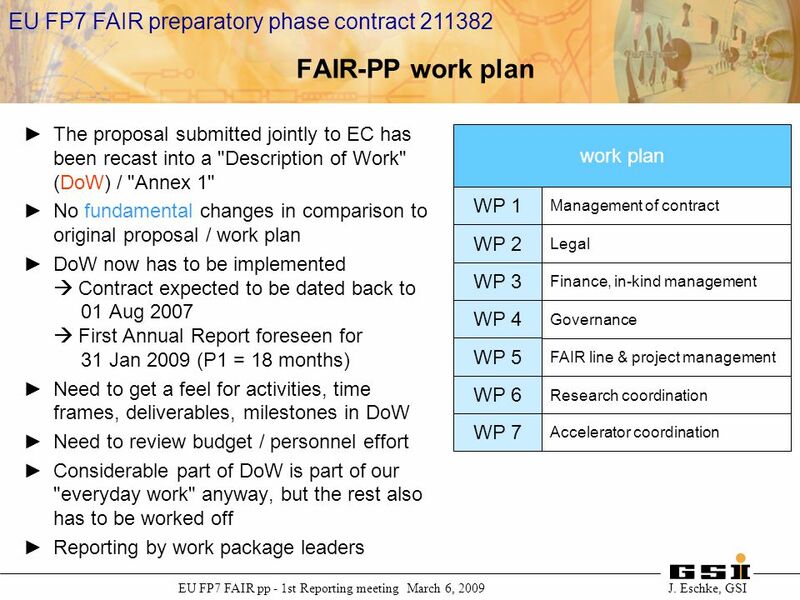 The 7th Framework Programme The Financial Issues Ray Lockyer Finance Business Systems 23 rd November 2007. 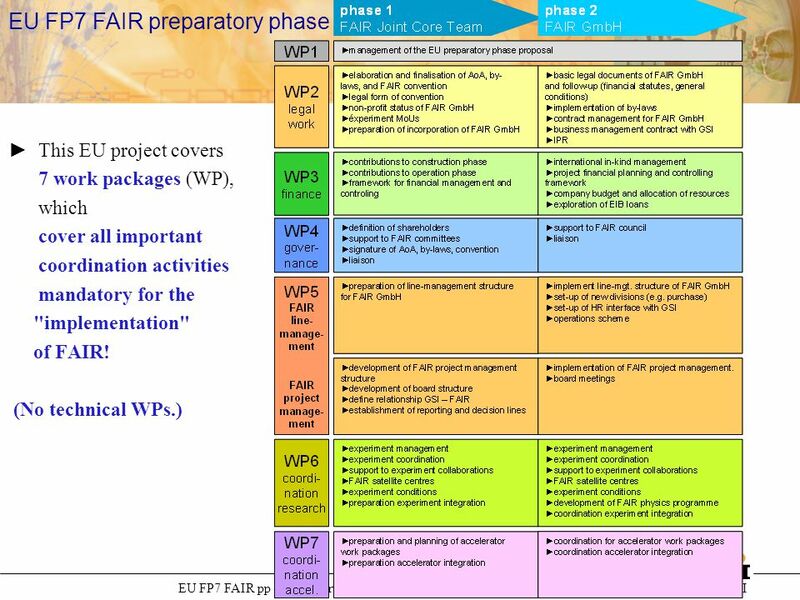 STABLE Kick-off meeting Torino – October 25 th - 26 th,2012 WP 7 Scientific coordination First phase (M1-M6) QIUPING CHEN POLITECNICO DI TORINO STABLE. 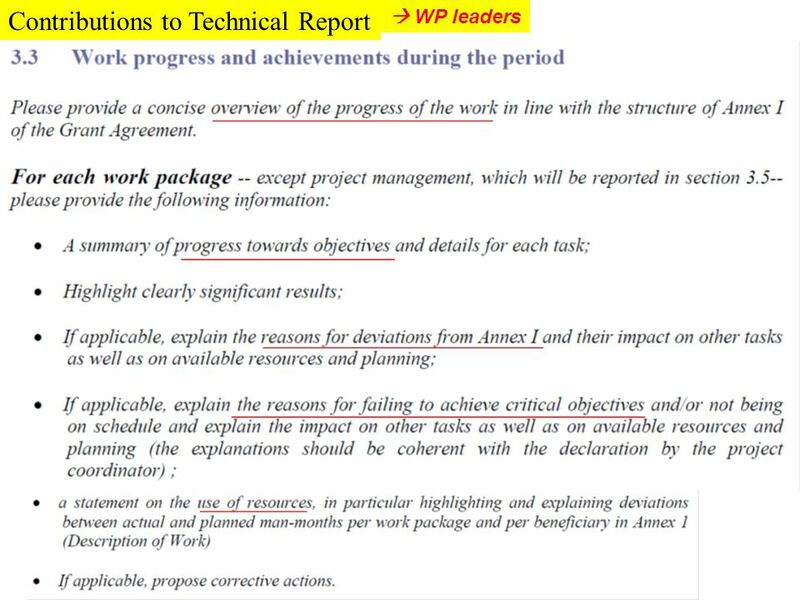 STRUCTURE SCIENTIFIC REPORT / MANAGEMENT REPORT Progress / objectives (WP and project level) Progress / milestones (WP and project level) Progress / deliverables. 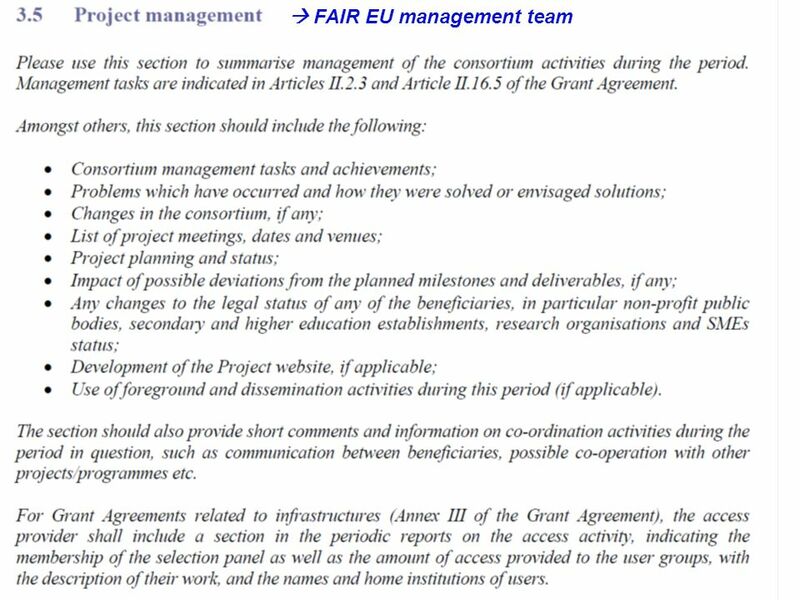 AIDA is co-funded by the European Commission within the Framework Programme 7 Capacities Specific Programme, Grant Agreement AIDA status report. 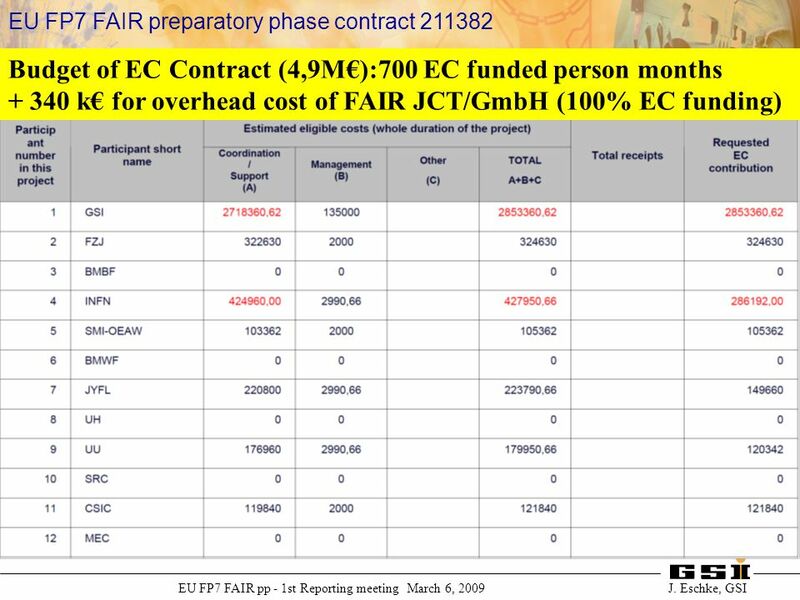 HiLumi LHC is co-funded by the EU FP7 Capacities Programme, Grant Agreement 284404 1 Svet Stavrev (EU Projects Office, CERN) Administrative Manager 17.